I am going to be blunt. Brain tumors are terrifying. I’m not really sure how else to say it. I could try to write something clever or witty or profound, but I would really just be beating around the bush. Any cancer diagnosis in our pets is distressing and brain cancer is no different. But there is something about the cancer being located in the brain that sounds scarier than others. Given that May is Brain Tumor Awareness Month, I should be feeling really crummy right now. But, today, I can’t help but feel grateful. I have spent a good deal of time over the last month researching patients that PetCure Oncology has treated for brain tumors. You would not believe some of the pictures and cases we see walk through the door. Many of these patients are in really bad shape when we meet them. And many of their human owners feel a sense of hopelessness that is truly heartbreaking. So, why do I feel grateful? As I dove into the research, I found some pretty amazing things. And as I spoke to some of the pet owners, I was humbled by their optimism and gratitude. They didn’t sound like devastated victims of a tragedy. They sounded like they had a new lease on life. Nancy Waikem is from Ohio. She has had two different pets with cancer. A few years back, her first such experience was nothing short of tragic. Between the steroids and side effects, the Waikem family was left feeling discouraged and defeated. But the conversation was completely different in January, when their current dog, Mark, was diagnosed with a brain tumor. Between the two incidents, stereotactic radiosurgery (SRS) emerged as a new treatment option for pets. As far as the Waikems was concerned, it was the only option worth considering to treat Mark’s brain tumor. No 15-21 anesthetic events. No surgery. No hospital stay. No side effects. I also talked to Steve Venier from New Jersey, whose dog has survived two different – and completely unrelated – bouts with brain cancer, both thanks to SRS. And the May family from Arizona, who gushed over their “little miracle dog” eight months after three quick sessions of SRS. 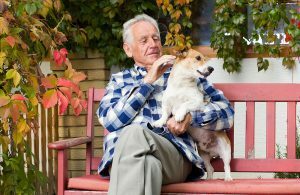 Cancer care for pets is changing. I, for one, feel incredibly encouraged. In less than a year, PetCure Oncology has treated nearly 300 patients with radiation therapy. Fifteen percent of them were afflicted with a tumor in the central nervous system or brain, making it the second-most common area of the body that we treat. As with any cancer, the most important factor in treatment is early detection. In the spirit of Brain Tumor Awareness Month, here is some information that may help you – or someone you know – catch a potential brain tumor early. While I think this information is helpful, I don’t want to unnecessarily scare anybody. It is important to note that while the symptoms listed above have been associated with pets diagnosed with brain tumors in the past, the presence of any one of these symptoms does not inherently suggest a brain tumor. If you have any concerns or questions regarding the well-being of your pet, please call your veterinarian immediately.